Jesus moved in, was one of a kind and lived a generous life. We are now called to live these out in our own lives. Yet one more thing is needed. Jesus led with grace while never compromising the truth of Gods word. And this is not an easy way to live. In a world that can often be all grace and no truth or all truth and no grace, as Christians we need the Holy Spirit to help us navigate this well. Jesus had grace for sinners but not for sin. He didn’t judge and condemn the woman in John 8 like everyone else was ready to do. Instead he led with grace but acknowledged the sin and need for change by encouraging to ‘go and sin no more’. This Christmas lets be slow to judge and quick to love and have a willingness to walk alongside people as they journey through the consequences of what ever decisions they made. Always good to remember to deal with the ‘log’ in our own eye before we comment on the ‘speck’ in someone elses. Integrity can be hard won but easily lost. In todays throw-away culture it doesn’t seem to carry the same value as it once did. When tolerance and acceptance are the by-words, alongside anything goes, it could be argued by some that integrity is just an old-fashioned and out-dated idea and we don’t even need to try to maintain our integrity anymore. Integrity is a personal discipline. I can’t make you a person of integrity, I can only sell you the benefits of no skeletons in the cupboard, no awkward conversations, no moments of indecision, no double-mindedness, no more living two different lives. Integrity helps make sure our yes is yes and our no is a no. It creates boundary lines for our life and how we will live within them are set when we have integrity. We know who we are and other choices have to line up. It doesn’t mean we don’t care about others but it does mean sometimes what we care about has to come first. Integrity comes from our why and it influences our what and our how. The why of my life is built on my Christian faith and the lifestyle that Jesus asks me to live out. I want my life to be whole and complete, in line with the word of God, thereby helping me maintain my integrity. While people may shout us down, while circumstances may be against us, while trouble may hit us from different sides, it is our integrity which gets us noticed by God. It protects us. Keeps us alive. We are blessed and sustained because of it. We are restored. Enemies will not triumph over us. This is a promise to hold on to. The next time you are tempted to neglect what you are doing and compromise your integrity, think again – with our integrity intact we are set in His presence forever. Losing that is too big a risk for me. 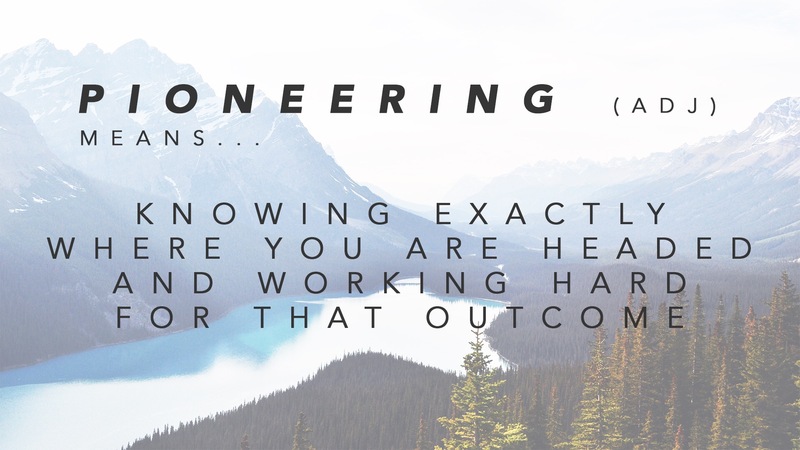 Maybe pioneering is about knowing exactly where you headed and working hard for that outcome. We can look at people from history and assume that’s what they did and maybe for some that was the case. For most though there is endless amounts of trial and error. There is a desire to do something without knowing exactly where it might lead. Pioneering maybe then is about committing to the journey, working hard but as a Christian then trusting God for the outcome. What might it be like for us if we just commit to the journey? What might the difference be like if we stop focusing too much on the end result and take the opportunities available right now? I think pioneering is less about the grand and more about doing what you can. What do you think? These seem like great verses to remind us all about how to behave towards others, the right kind of attitude we should be employing every day. Just to ensure that the light we are shining brightly reflects well on the good deeds of our Father in heaven and brings Him glory. It seems an especially good reminder in light of the current conversations, comments and opinions flying around in regard to the EU Referendum. I liked this article too as a reminder of what the Bible says about politics. Whichever side you vote for, we are first and foremost followers of Jesus, so let’s take our lead from Him and His word, and take care in ensuring that the strength of our opinions don’t see us become opinionated. Remember ~ to have an opinion is to share something that you believe. To be opinionated means you think your opinion is right, and whoever disagrees is wrong or stupid. Just a thought, amongst all the other thoughts. Ignore me if you think I’m out of line. Let’s lead well in ALL things, however passionate we may feel about whatever we are talking about. Ok. So this is a curious title. It is a well known phrase that describes the persuasive power of numbers, especially to prove certain things. We are not about that but in our weekly meeting tomorrow we are talking numbers. They are not our primary driver, but they are important. Nobody wants to think that we don’t care about the finances. We track the income and expenditure – you would expect that. Yet counting people and tracking numbers when it comes to people can often offend people. I think that’s because we don’t understand their importance…. We count people because people count. It is a cliche statement but it doesn’t make it any less true. We can feel like things are going well but the numbers rarely lie. We can always choose the right ‘period of time’ to make us look good. Neither are acceptable. Get the figures in front of you and be honest about what they tell you. We don’t substitute faith for numbers. We are still a faith church. We are still trusting God for the future. We pray like it depends on God. Yet we still work hard and make sure that what we are putting our energy and resources towards is actually making a difference. So today on my first day back I gathered those figures together ready for discussion in the morning. I can’t share the stats but I can say this…things are healthy. Leadership isn’t about power or control or hierarchy, but is it about serving. Whenever I take the lead, whenever I place myself in that position of authority, the key isn’t what I get to do, how important I can become or feel. Instead it’s about how willing I am to serve those around me. Leaders serve others. Am I willing to help someone? Am I willing to care for someone? Am i willing to bend the knee for someone? Jesus is my ultimate role model. All the power in His hands. All the authority in His hands. All the title in His hands. Yet, He stooped down, picked up a towel and washed His disciples feet. We might respond and say ‘well that was Jesus, he was making a point, I couldn’t do that.’ We might justify our position, speak of rights and remind about title. If we do then I think we miss the point. I have all of these but they really count for nothing if I am not willing to lay them to one side, to humble myself, to ignore the inconvenience of it all, and serve. God gives grace to the humble. He resists the proud. To measure my leadership by a different yardstick isn’t always comfortable but that doesn’t make it any less important. As I lead, Lord, help me to serve. We often look for people to learn from, someone to be a mentor, a role model who lives out the kind of life we may aspire to. I want and look for these people in my life. Here’s the challenge. As much as I want that for myself, who would want that of me? Could I confidently say to someone, like the Apostle Paul, that they should practice the way I live? That requires looking at my life and asking some honest questions as to whether they would learn, receive, hear and see things worth practicing. And that might be a little uncomfortable. Yet this is the call of God. To lay down my own life and carry the one He has for me. To surrender to Jesus, to sacrifice for Jesus and to serve Jesus. In doing this then maybe my life becomes one worth imitating, one where others can copy what they hear and see, learn and receive. Listened to a Pastor last week make a passing comment about ‘not really doing secular’. It’s an interesting comment, one I do not have the full context of, but one that has certainly made me think. It’s made me observe my life too. Am I loving the secular too much? Does my love for the secular squeeze out my love for God? Do I try and live too close to the edge of my faith so I still ‘fit in’? Should I give some stuff up in response to what Jesus gave up for me? I think the answer to all of these questions is probably ‘YES’. If we are honest, the answer for nearly everyone would be ‘YES’. It’s so easy to fill time with anything. I’m not advocating the need to throw out the television or be quite so dramatic. For me it’s more a need to reflect and have a willingness to be really honest with myself. What actually do I think I can’t live without? What behaviours as a Christian just make a mockery of me saying that I am a Christian? Why am I wiling to settle for such a low standard when Jesus had called me to live the full life He has won for me? It can be tough being a follower of Jesus. It can involve choosing to not do stuff that others consider normal. And here’s why…because the life God has for any of us is far superior to any temporary pleasure we can enjoy in the moment. If you are a Christian I would love to know what you think about this.